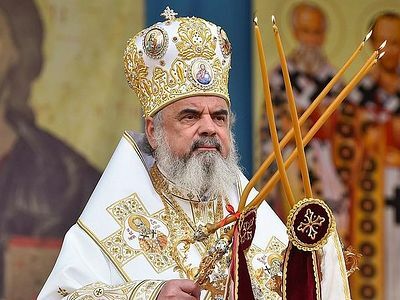 At the end of the solemn meeting of the Holy Synod of the Romanian Orthodox Church, in the presence of His Eminence Pavlos, Metropolitan of Drama, the Holy Synod decided to add St. George (Karslides) the New Confessor of Drama to the calendar of the Romanian Orthodox Church. 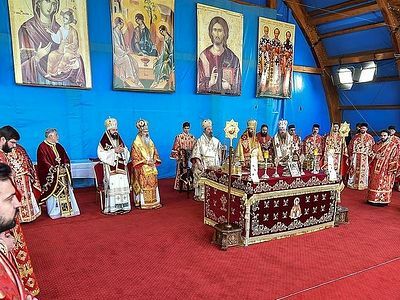 In the historical parekklesion (chapel) of the Great Martyr St. George of the Patriarchal residence an icon and a reliquary containing a fragment of the holy relics of St. George are sheltered, offered by His Eminence Metropolitan Pavlos of Drama on July 20, 2010 on the occasion of the birthday of His Beatitude Patriarch Daniel and of the re-consecration of the historical parekklesion. Our Venerable Father George was born in 1901 in the city of Argyropolis in the region of Pontus (today’s Gümüșhane, Turkey), the son of two pious Christians named Savva and Sophia Karslides. He received the name of Athanasios in holy Baptism. At a young age he became an orphan and was raised by his elder brother and sister and by his grandmother on his father’s side. After the death of his grandmother, who offered him as a blessing an icon of the Theotokos which he kept his entire life, he left together with his grandfather from his hometown to Erzurum (Turkey), and then to Tbilisi (Georgia). Full of divine love, young Athanasios entered the community of the Georgian monastery New Athos. There he studied the Georgian language, but especially he labored to acquire obedience, humbleness, patience, vigilance and prayer. On July 20, 1919 he received the monastic tonsure with the name of Symeon. After a short while, he was imprisoned and cruelly tortured by the atheists. In 1923, he was freed and moved to Sukhumi (Abkhazia). On September 8, 1925 he was ordained a priest by a Georgian hierarch who changed his name into George. Venerable George left for Greece in 1929 and settled in the village of Sipsa (today Taxiarches), next to Drama, where he developed rich spiritual activity among the faithful whom he drew near to the Church and guided especially to the holy mystery of Repentance (Confession), to which he afforded particular importance. In 1936 he traveled as a pilgrim to the Holy Land, filled with the longing to see the places where Christ our Lord wrought the salvation of the world. After returning to Sipsa, in 1939, Venerable George decided to build a monastery dedicated to the Ascension of the Lord, with a small church and some dwellings. In 1959, he foresaw his impending end, notifying his close disciples about it several times. In the very break of morning, on November 4, after praying before an icon of the Theotokos, “O blessed Theotokos open the doors of compassion to us,” Venerable George the Confessor commended his soul into the hands of our Savior Jesus Christ. 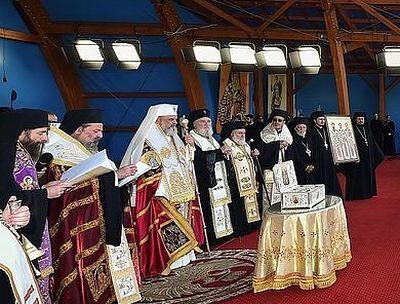 After three days, the incorrupt body of Venerable George was buried next to the monastery founded by him by Metropolitan Phillip of Drama. Numerous healings and wondrous appearances occurred after his passing to the Lord. His relics, full of a wondrous fragrance, were discovered on February 9, 2006 by His Eminence Pavlos, Metropolitan of Drama. He was canonized by the Ecumenical Patriarchate of Constantinople on March 18, 2008 with his feast day on November 4, the day of his passing to the Lord. Let us the faithful honor with hymns Venerable George, the founder of the honorable Monastery of the Ascension, the teacher of the prayer of the heart, of humbleness and vigilance, as a new boast of the Confessors, crying: Protect by divine support, O Passion-bearer, all those who pray to thee! Let us worthily praise in pious hymns the untiring worker of virtue, who by the plow of love and true faith made souls fruitful and founded in the latter times the Monastery of the Ascension in Drama, crying: Rejoice, O blessed George! And their voices have been heard. The sun called John Chrysostom hasn’t set ever since. His mouth and his golden words have never been sealed. The writings and sayings of the golden-mouthed saint are decisive. Through his writings and sayings he is a contemporary of every generation, and especially of our generation.